Looking for a specific dish/recipe? Use the search function (click the little magnifying glass on the top right hand corner of the page)! Put in keywords, names of dishes or even an ingredient it contains, and all relevant recipes will show up! Questions about my cookware and equipment? Please check out this page where I list most of them. Where to buy Thai ingredients? Check out this map to find a store near you. Going to Thailand and want recommendations? Check out some of my food travel videos here for some ideas. Though to be honest, I am not the best person to ask as I have not lived in Thailand for a very long time and I only go back to visit my family each year, so I’m not in touch with the most updated travel info! Website/technical issues: Is the website misbehaving? Let us know at: adam |at| hotthaikitchen |dot| com with the details and he’ll get right on it! 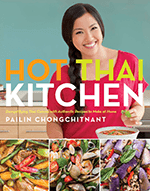 For any other inquiries: You can contact me via Facebook or Twitter, or you can send a message to pailin |at| hotthaikitchen |dot| com. Please keep in mind that due to the volume of messages, it may take me several days to get back to you.